The fact that we can start a Raiders article on December 26 and say that they were officially eliminated from the playoffs today, in Week 16, is major progress. I think in 2005 they were eliminated in Week three of the pre-season. I mean we’ve seen some lean times the last few years, and for the first time since Rich Gannon was throwing the ball, the future is bright. Jason Campbell made significant strides this year and will begin next year as the starting quarterback. He still has your occasional stinker of a game, but for the most part, I’ve seen enough from him to think he can get the job done. Especially if that job involves giving the ball to Darren McFadden. 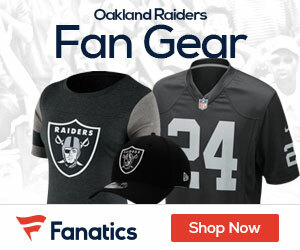 The Raiders knew that McFadden was a special player when they took him with the 4th pick of the first round in the 2008 NFL Draft. He endured some injury plagued seasons in ’08 & ‘09, but busted out this season to be a force who can score anytime he touches the ball. And keep this in mind: he’ll turn only 24 during next year’s training camp. The other standout for the Raiders has been Jacoby Ford, who took the opening kick of the 2nd half back against the Chiefs in Week 9 and never looked back. He took another kick back against the Colts, a week after running 71 yards from scrimmage on an end-around on the first play against Denver. One of the fastest men in the NFL, Ford is a dynamo who can provide a big play at any moment. We all know how much Al Davis loves speed, but someone who is fast and good is even better. We’ve had plenty of speed, not enough good. Marcel Reese, Zach Miller and Darrius Heyward-Bey have all contributed at times, helping the offense become at times, shall I say, explosive. We’ve come along way from Andre Walter to Ronald Curry. On the defensive side of things, the Raiders have some work to do. There are plenty of good things to talk about, but just as many question marks remain going into 2011. The bottom line is this. 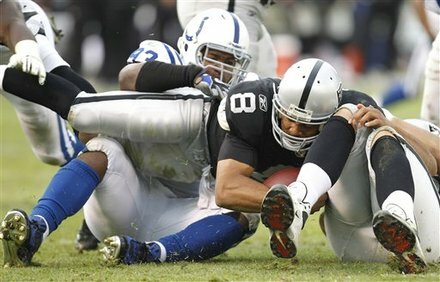 If Oakland can win next week in Kansas City, they will finish the season at 8-8, but 6-0 in the AFC West. They will have swept all 3 of their divisional foes. Once they figure out how to win outside their division, this team could be really good. For years now, this team has been frighteningly bad. Next year, let’s hope their just scary.